Although historical events have been explained repeatedly from the perspectives of economics, politics, culture, etc., the hidden role of climate change is equally deserving of attention from a newly rising paradigm of environmental humanities. Scholars have noted, for example, that Europe experienced chaos during the Spörer Minimum, a period of colder-than-average temperatures starting in the 1450s. The cold spell resulted in crop failures and famines, which in turn led to epidemics, increases in grain prices, disruptions in the grain trade, and social unrest. 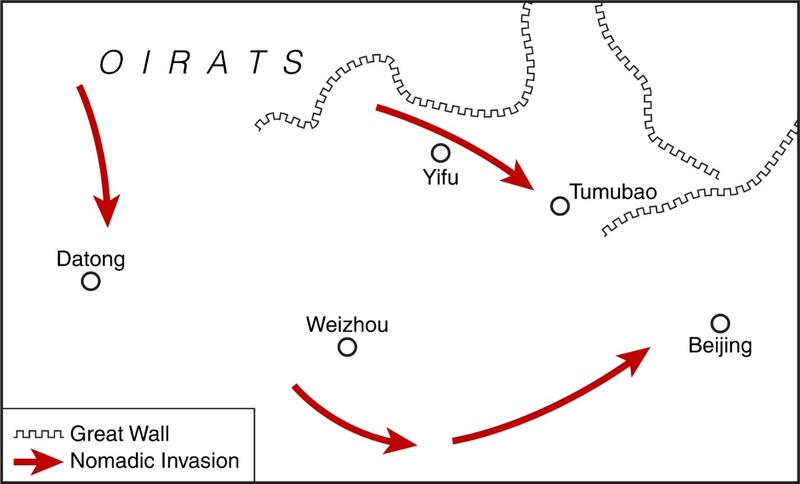 During approximately the same period, the Ming Dynasty (1368–1644) of China faced the Tumu Crisis (土木之变). In 1449, Beijing was conquered by the Oirats, and the Yingzong Emperor (英宗, 1437–1464) was imprisoned as a result. Pei, Qing, David D. Zhang, and Harry F. Lee. “Contextualizing Human Migration in Different Agro-Ecological Zones in Ancient China.” Quaternary International 2015. doi:10.1016/j.quaint.2015.12.007. In reviewing Chinese history, the majority of battles with nomadic minorities along the Great Wall occurred during the Ming Dynasty. 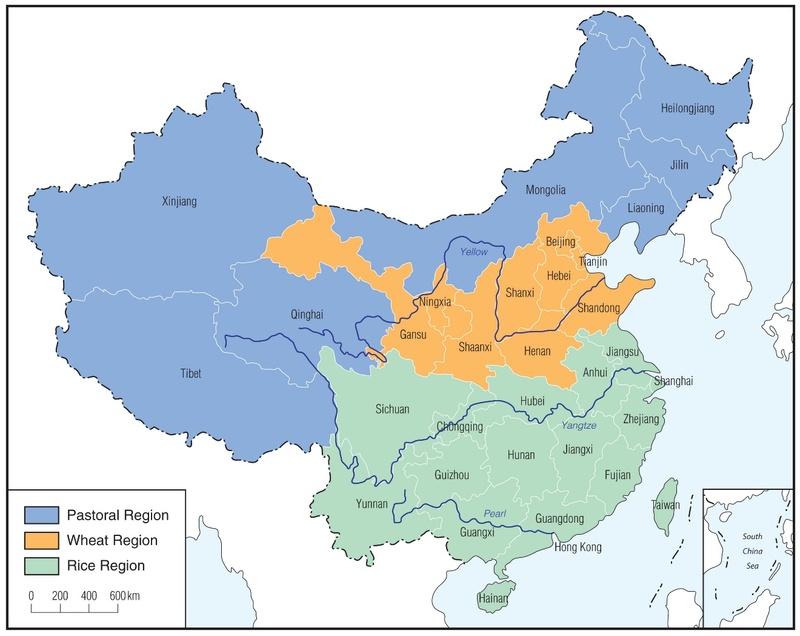 On the basis of agricultural geography, the Chinese empire during this time could be roughly divided into three regions: the pastoral region, wheat region, and rice region. The latter two regions (wheat and rice) were considered the major farming area of China. The Oirat troops invaded the territory of the Ming Dynasty from the north, as illustrated here. Historians have identified the emperor’s failure in military actions, political institutions, and international relationships as major factors in the Tumu Crisis. According to the historical records, Esen Taishi (? – 1454), the leader of the Oirats, was dissatisfied with the tribute of the Ming Dynasty. 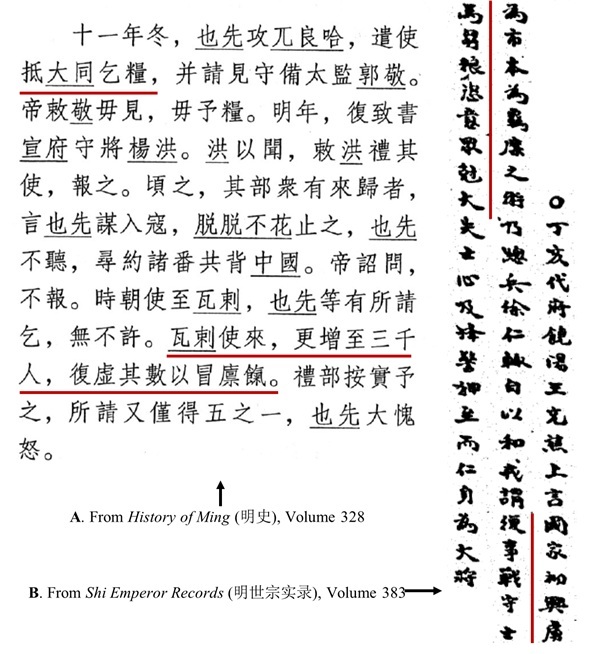 Although the “tribute” required by Esen Taishi was actually overstated and unreal, he launched the invasion because the Ming Dynasty did not meet his request. The pastoral region did not produce enough food to support the nomadic minorities; thus, they needed additional supplies from other regions. The Ming Dynasty adopted the tribute as a temporary but peace-oriented policy to avoid conflict. In fact, tribute, along with other measures, has been used by some other dynasties throughout Chinese history to stabilize their relationship with surrounding minorities. However, the issue of resources should not be neglected in interpreting the conflicts, such as the Tumu Crisis between the nomadic minorities and the Ming Dynasty. An agrarian economy is very sensitive to changes in climate and a pastoral system even more so, and this vulnerability of the pastoral system affected the geopolitical relationships between the two groups in historical China. The southward aggression and even nomadic migration were deeply connected to climatic factors because nomadic groups like the Oirats had to find sufficient forage and water. If the climate changed, immediate migration to a location with adequate grass and water was the only feasible option for the nomads to survive—given the limited food resources in ancient China. Under such conditions that the likelihood of conflicts between the nomadic tribes and the residents of the Ming Dynasty increased substantially. Several paleo-climatological studies have reconstructed the climate during this time. Using current findings as a basis, the graphs below present the climatic conditions during the Tumu Crisis. From 1448 to 1451, China experienced the sharpest decline in temperature and precipitation. 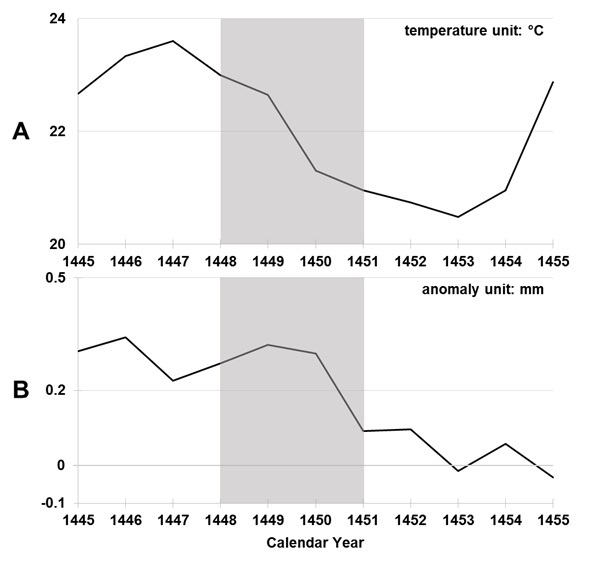 The temperature decrease started in 1447, with the highest rate of decline in 1449. Similarly, precipitation started to decrease in 1448, decreasing most rapidly and voluminously in 1450. The Tumu Crisis lasted from 1449 to 1450, coinciding with this period of cooling and drought. Current knowledge implies that climate change should be regarded as a trigger of the nomadic invasion, partly explaining the launch of military actions by the Oirat troops against the Ming Dynasty during the Tumu Crisis. Index of climatic conditions, 1445–1455. A. Temperature reconstruction (warm season temperature) in Hebei Province, China. B. Precipitation index (annual anomaly) reconstruction for the whole of China. Graph A. Data retrieved from: Tan, Ming, et al. “Cyclic Rapid Warming on Centennial-Scale Revealed by a 2650-Year Stalagmite Record of Warm Season Temperature.” Geophysical Research Letters 30 (2003): 1617. Graph B. Data retrieved from: Pei, Qing, and David D. Zhang. “Long-term Relationship between Climate Change and Nomadic Migration in Historical China.” Ecology and Society 19, no. 2 (2014): 68. The study does not claim that climate change is the only one or even the major cause of the Tumu Crisis; instead it aims to reveal the hidden role of climate change in history in general, as well as a factor that potentially contributed to the Tumu Crisis. Furthermore, the case of the Tumu Crisis shows that the large repository of historical documents in China may be able to provide additional empirical evidence to investigate the links between nature and human society. Pei, Qing. “Conquest of Beijing: Hidden Contributions of Climate Change to the Tumu Crisis, 1449–1450.” Environment & Society Portal, Arcadia (Autumn 2016), no. 12. Rachel Carson Center for Environment and Society. https://doi.org/10.5282/rcc/7639. Bradley, Raymond S. Paleoclimatology: Reconstructing Climates of the Quaternary. Amsterdam: Elsevier, 2014. Camenisch, Chantal, Kathrin M. Keller, Melanie Salvisberg, Benjamin Amann, Martin Bauch, Sandro Blumer, and Rudolf Brázdil, et al. "The Early Spörer Minimum—A Period of Extraordinary Climate and Socio-Economic Changes in Western and Central Europe." Climate of the Past Discussions (2016). doi:10.5194/cp-2016-7. Forêt, Philippe, Marcus Hall, and Christoph Kueffer. "Developing the Environmental Humanities: A Swiss Perspective." GAIA-Ecological Perspectives for Science and Society 23 (2014). Homer-Dixon, Thomas F. Environment, Scarcity, and Violence. Princeton, NJ: Princeton University Press, 1999. Lee, James. "Migration and Expansion in Chinese History." In Human Migration: Patterns and Policies, edited by William H. McNeill, and Ruth S. Adams, 20-47. Bloomington, Indiana. : Indiana University Press, 1978. Pei, Qing, David D. Zhang, and Harry F. Lee. "Contextualizing Human Migration in Different Agro-Ecological Zones in Ancient China." Quaternary International 2015. doi:10.1016/j.quaint.2015.12.007. Pei, Qing, and David D. Zhang. "Long-term Relationship between Climate Change and Nomadic Migration in Historical China." Ecology and Society 19, no. 2 (2014): 68. Qing Pei is currently working as an Assistant Professor in the Department of Social Sciences at the Education University of Hong Kong. He holds a Ph.D. degree in geography from the University of Hong Kong. He used to be a Postdoctoral Fellow at the University of Hong Kong and a Swiss National Science Foundation Fellow at the University of Zurich. His research interests mainly encompass climate change and human society, environment-human geography as well as geo-statistics and their application.